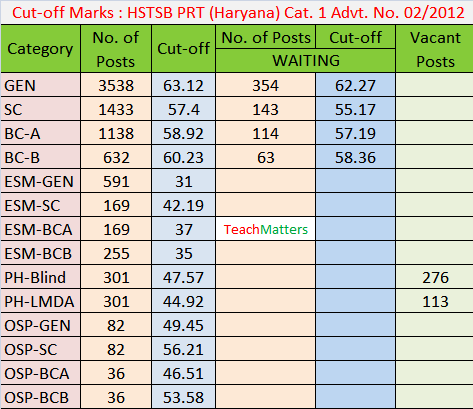 HSTSB has published the result of Primary Teacher (8763 Posts) Cat. No.1 Advt. No.2/2012 (Non-Mewat) for recruitment in Haryana govt. schools. On the basis of interviews held recently, the Haryana School Teachers Selection Board has finalized the result for the under mentioned category of post. The candidates with following roll numbers have been selected. The result has been shown roll number wise and category wise and the marks secured by the last selected candidate in each category have been shown in bracket. The un-selected candidates in the above mentioned result, who wish to know the marks secured by them, may apply on plain paper to the undersigned within one month from the date of publication of this result. Such candidates will have to deposit a fee of Rs. 100/- only in the Haryana Government Treasury in the Major Head : 0070 - other administrative services, Sub Major Head : 60 - Other Services, Minor Head : 800 - Other Receipts, Sub Head : 86 - Fee Under the Right to Information Act, 2005. A self addressed and duly stamped envelope should be accompanied with the request. The marks will be intimated to such candidates within one month thereafter. The above result will be subject to the outcome of CWP No. 346 of 2013 and other connected matters which are pending for adjudication in Hon'ble Punjab & Haryana High Court . The result of the candidates who were provisionally interviewed in pursuance to the interim orders passed in relevant CWPs and notice dated 15.11.2013 of the Board, has been kept in sealed cover till the disposal of the concerned Civil Writ Petitions as their eligibility will be decided as per the decision / orders of the Hon'ble High Court. In case, the Hon'ble High Court holds their eligibility for the post of Primary Teacher then the above result will be amended/modified accordingly as per their merit. Resultantly, candidates lower in merit in above result will be ousted and the candidates whose result has been kept in sealed cover and fall in selection zone will be included in selection list accordingly. The detailed result of the eligible candidates except court cases will be unloaded on HSTSB website separately later. While every case has been taken in preparing the result, possibility of inadvertent errors cannot be ruled out . The Board reserves the right to rectify the same later on.